The series featured the adventures of a rock group called the Holograms. It aired in first-run syndication between 1985 and 1988. The premise of the series: Jerrica Benton is the owner and manager of both Starlight Music and Starlight House (the latter a foster home for girls), both inherited from her deceased genius father. Her father also left Jerrica with his greatest invention, “Synergy,” a powerful audio-visual computer with holographic capabilities. Synergy’s verbally controlled or communicated with via the use of special “Jemstar” earrings Jerrica wears. Along with various holographic illusions, Synergy also allows Jerrica to create her “Jem” identity as a hologram projected over herself. 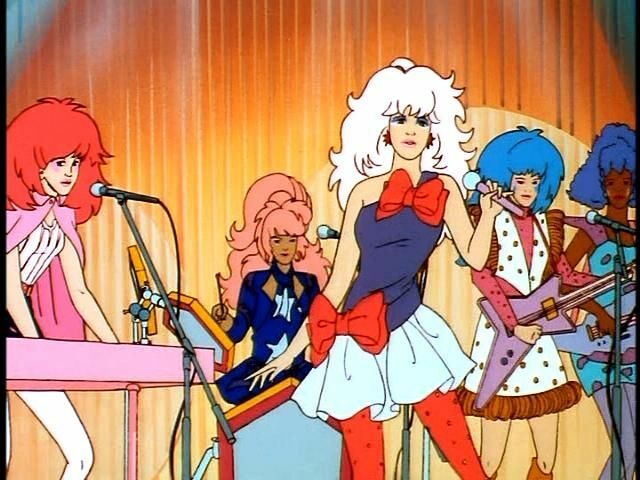 As Jem, Jerrica serves as the lead singer for the Holograms. Episodes would often see the Holograms travel the world, giving concerts and having assorted adventures, similar to Josie and the Pussycats 15 years earlier. Kimber Benton, Jerrica’s younger sister. Kimber is the main songwriter for the Holograms, and also performs various instruments. Aja Leith, the band’s lead guitarist and back-up vocalist. An Asian-American woman who, along with the other Holograms, grew up at Starlight House. Shana Elmsford, an African-American woman who plays the group’s bass guitar, synth drums, and backup vocals. Carman “Raya” Alonso, a Mexican-American drummer and backup singer for the group. The main nemesis/rival to the Holograms in the series is the fellow rock group “The Misfits,” who seem reasonably popular in their own right, but not as popular as the Holograms. Episodes often revolve around the Misfits’ glory-hound (or outright dangerous) tactics to gain fame at the expense of (and sometimes risk to) the Holograms. The Misfits often relied on the aid of their sleazy manager, Eric Raymond, the former co-owner of Starlight Music. The third season saw a second rival group, “The Stingers,” introduced. “Jem” ran for three seasons with a total of 65 episodes. Each episode featured various song numbers, often in the form of a music video—per MTV’s raging success back when they actually played music videos. The usual tie-in toys, etc. were also released. Since the series ended, all things “Jem”-related stayed quiet until the 2010s, when nostalgia brought the dormant franchise back to new life. “Jem”‘s received a box set DVD release, featuring the entire series, as well as the usual extras, interviews, etc. In 2015, “Jem” received a theatrical live-action movie. Unfortunately, it was poorly received by the show’s fans due to being unfaithful to the original series’ spirit, and flopped hard. Despite a budget of only $5 million, it only made $2.3 million at the box office. On a more positive note, 2015 also saw the release via IDW of an ongoing “Jem” comic. The comic’s received much praise for how it’s updated and handled the characters. In the comic, Kimber’s revealed to be a lesbian, and in a relationship. It’s now a popular enough book that the Misfits have received a spin-off series.